The Owlmandos have entered the air duct from the roof, ready to wreck SoloChem’s nefarious plans. The narrow, twisting air ducts empty into a cramped, two foot high crawlspace that stretches out on all sides for as far as you can see in the dim light. The crawlspace floor is made of flimsy tiles suspended from the ceiling with metal struts. The area is filled with electrical wiring, plumbing, sprinkler system machinery, and ventilation shafts. You hear murmuring voices directly below you, and thin streams of light shine up from cracks in the flimsy tiles below your feet. You suddenly realize that you are in the drop ceiling above the labs. The crawlspace “floor” is made of lightweight ceiling tiles suspended below the roof of the building. The two foot gap between the real ceiling and the drop ceiling is just enough room…to travel freely. Tristan gently lifts one of the tiles and the owls crowd together to peer inside. They see a number of technicians bustling about, administering strange injections into freighted rats, lizards, and other creatures. Gawain grips his sword and readies himself to charge in, but is stopped by Percival, who shakes his head, desiring caution. Gawain ruffles his feathers, but gives into his brothers. For now, at least. Carefully picking their steps, they make their way around the crawlspace. Over the towering skyscrapers of New York, three silent figures glide overhead. Slowly, they approach the waterfront, wings gently flapping, as they cross the roofs of crumbling old word buildings. Then, a towering, high tech fortress looms over the water like a sullen giant. 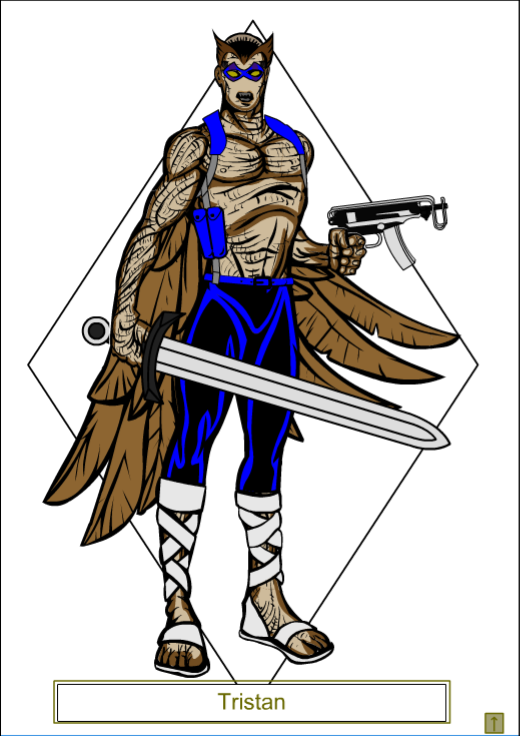 The Owlmandos are approaching the headquarters of SoloChem, a violent crime cartel. Over the past few weeks, an instantly addictive designer drug called “Blue Ice” has been hitting the streets. Det. “Bulldog” Payne, their liaison with the New York Police, has traced its manufacture to the top floors of this very respectable-looking, though heavily fortified, building. Mass shipments are due to leave tomorrow for destinations around the country, where they will be given away as “free samples,” creating hordes of instant addicts. Bribes from SoloChem boss Fred Porcelain have kept the cops away, but the Owlmandos have no such restrictions. They have been charged with destroying the lab and the shipments, but to retrieve any documentation and samples, for later prosecution. The building is too well-fortified for a direct assault, which is why the Owlmando’s were sent on this mission. The roof is the weakest point, and the silently swoop around the building to gather information. The roof is empty except for a few small chimneys, a helicopter, a two-foot wide air duct, and a bored goon yawning as he patrols around the rooftop door. A walkie-talkie hangs on his hip, and he is listening to it through a pair of headphones. Gawain glances at his brother Tristan, who responds with a curt nod of approval. Gawain breaks formation and swoops high into the air, then folds his wings and dives quickly at the bored guard. Created by the eccentric and brilliant billionaire Doctor Thurston Rheinhart, these avian heroes were raised to protect and cherish humanity. Working with Detective Jack “Bulldog” Payne and his elite Special Investigation Squad, they take to the night to battle those threats too strange, too bizarre, and too dangerous for the NYPD. Threats only the Owlmando’s can handle! Since their debut a few months ago, the Owlmando’s have become a popular “urban legend” around New York, and have successfully thwarted The Shadow numerous times. Now they are focused on cleaning up the streets. Disposition: Brave, caring, and considerate. Just wants to do what’s right. Personality: He was raised to be a hero, and being a hero is all he wants to be. Tristan truly tries to make the best of any situation, and will do his best to save and protect as many as he can. He loves his brothers, and his family, but he still often feels alone. More than anything, he would like to be able to get out and meet normal people and be part of the wider world, but he knows his responsibilities prevent such a thing. I’m starting up a new series of Solo play, for “Solo A Module Month.” In this event, Solo gamers take a crack at playing a traditional party-based module and playing it Solo. My attempt last year fizzled out for me, but I’m eager to give it another go. 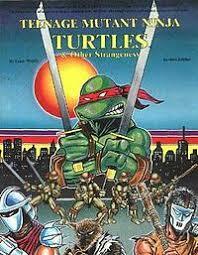 After quite a bit of sifting, I’ve decided to go with Teenage Mutant Ninja Turtles & Other Strangeness (TMNT) by Palladium Books. This game is currently Out of Print, unfortunately, but I still have my copy sitting on a shelf, and I haven’t had a chance to play it in years. The basic system is the Palladium (or ”Megaversal”) system. Combat is essentially d20 based, while its Skills are Percentile. Nothing too radical, and its clearly an “Old School” system. Given that it is a somewhat quirky system, I’ll be including quite a bit of the mechanics of the game as they come up. I’ve done a previous series using the Palladium system, the Metal Angel series was based off of the Heroes Unlimited game, which is, in many ways, a companion to TMNT. I recently got a copy of the 5th Edition of Vampire: The Masquerade. One of its elements that stood out to me was a narrative approach to resolving scenes, often with a single skill check. Basically, the Storyteller describes a scene and the challenge related to it, the player makes the roll, and then together they come up with an explanation of what happened. This is not intended as the primary resolution system, but a way to simplify more basic scenes and to keep the focus on the drama, rather than on the dice rolls. It honestly reminded me quite a bit about how various Solo games handle scene resolution--in particular Libre and Bivius. You use the rolls to define the action, rather than the opposite. In a standard scene, a player declare that they are going to throw a punch; they would then roll dice, resolve the action, and deal with whatever consequences. Often with a lot of back and forth. In this setup, the idea is that you would roll a single combat roll, and that would resolve the entirety of the fight. Thousand Year Old Vampire is a Solo Roleplaying game, in which you chronicle the centuries of existence as one of the undead. It was launched as a Kickstarter on October 24th, 2018. As part of the Kickstarter campaign, a set of playtest rules were included with the campaign. The following Actual Play was based on these playtest rules. The story follows the existence of Roman politician Lucius Casius from the end of the Republic till the Italian Renaissance. I do not wish to spoil too much about the game, or the playthrough below. I will simply say that Thousand Year Old Vampire was a unique and impactful game; something many games strive for, but few succeed. If you are discovering this on or before November 15th, 2018, I strongly urge you to support the Kickstarter here. If afterwards, look for the game on drivethrurpg.